Fahad Rage, an engineering student from Walthamstow studying for a Masters in Mechanical Engineering at University College London, has won a Future Industry Leaders Award at a recent ceremony at the Institution of Engineering and Technology in London. Having undertaken a ‘Year in Industry’, the work placement programme run by charity EDT (the Engineering Development Trust), Fahad’s work was assessed, along with eight other finalists, by a panel of expert judges. 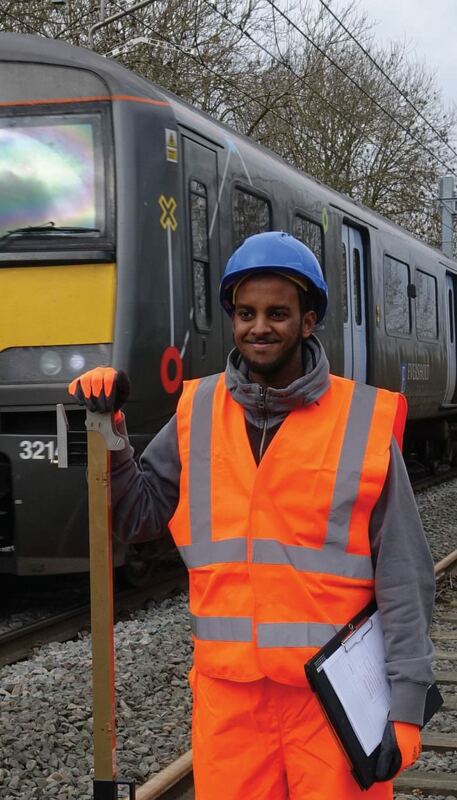 Undertaking a work placement with electrification specialist Furrer+Frey, Fahad’s initial brief was to come up with a tool for improving the compatibility of electrification design to Network Rail’s High Output Plant System (HOPS), used to install overhead line structures on the Great Western Railway. Having first learned the necessary programming skills, he created an App which allows designers to input key parameters and discover instantly whether a planned installation is compatible with HOPS, ensuring that work can be delivered safely and efficiently, saving significant time and money. What about new recruits that have been qualified to install new overhead wires and new overhead line structures and materials for the Great Eastern Main Line and the overhead wiring renewals on the Southend Victoria line as old overhead wires and overhead line structures to be replaced by new overhead line structures and gantries and support masts and new overhead wires to be installed on the Southend Victoria line (Shenfield-Southend Victoria route). The entire railway industry does not revolve around the Great Eastern lines. It might not be newsworthy but Network Rail are keeping up with regular renewals.